And now, let us continue with my Tales of the Mojave series. In our last post, we had barely left town—town being Reno, NV, hundreds of miles to the north, and we being Allie and I, two young and fairly junior geologists: I was beginning my fourth full year as an exploration geologist; Allie was beginning her first. Besides the several recon targets I had generated while we were still in Reno, we also had a placer submittal to examine and evaluate. Placer claims are a dime a dozen in the Mojave, and they are typically worthless—at least in my limited experience. (Actual placer miners might disagree with my assessment, but I'm using the mindset of large, hard-rock mining and exploration companies.) Unlike lode mining claims, placer claims can be increased in size if an association (group of more than one person) locates the claim: The usual 20 acres per lode claim or individual placer claim can be as large as 160 acres in an association placer when located by 8 or more claimants. Association placers can, in other words, cover an entire quarter section, making it possible to cover a lot of ground with relatively few claims, something that was done widely across the lowlands of the Mojave Desert of California in the 1980s (and elsewhere, like Arizona, and elsewhen, perhaps even right now). 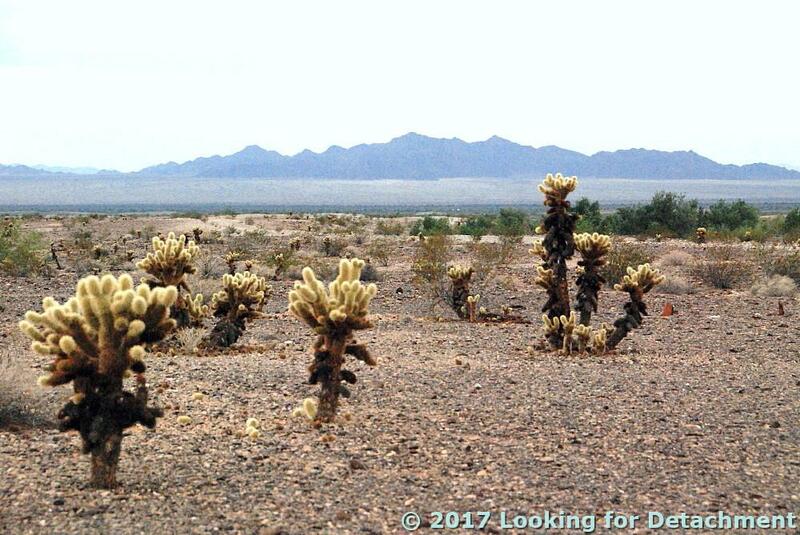 Many of the placer submittals we received during the 80s were located not only for gold, but also for platinum, an element that is quite rare in the placer settings of the southwestern deserts. The desert sun glared through the windshield of the truck as if to threaten us with heat stroke or worse, and heat waves rose inexorably from broad alluvial fans and bajadas, countless meandering dry washes, and endless desert pavement. As we turned onto dirt somewhere between Vidal Junction, CA, and Parker, AZ, I wondered what we were getting ourselves into. 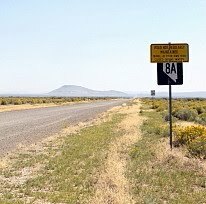 It wasn’t just the question of evaluating a dry placer property located miles from running water, but also the larger question: What were we doing in the Mojave in June? 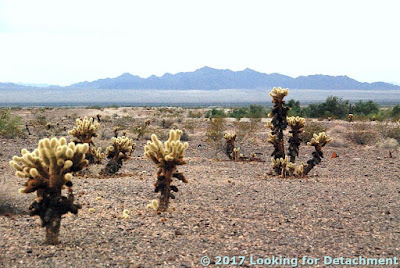 We drove down the fan, over rocks and by countless jumping cholla, not knowing for sure where we'd end up, not having to meet with the prospector, as one does so often when checking out a submittal. It didn't take long, really, before we found the spot, nearly lost in low, decapitated hills and erratic dry washes south of the Whipple Mountains, buried under a millennium’s worth of accumulated sand and dust. Dust covers entire mountain ranges in the western Mojave Desert, and it collects on pool tables in towns up and down the Colorado River in the eastern Mojave. Parker, Arizona, is one of those towns. Hopefully we'll stop in Parker some other time. We had brought extra water with us in 5-gallon containers, including 1 or 2 basic upright cooler types and several clear, collapsible plastic types. The extra water was, at this point, for evaluation of the claims, not for our own hydration, but the extra containers would serve us well as our expedition unfolded. So far we hadn't noticed anything untoward in the flavor of the water, primarily because we had filled our containers north of the NV-CA line, probably in Reno. Desert water can taste absolutely awful. As property reviewers, we would not only have to determine whether gold was present, but we would have to make some deliberation as to the feasibility of mining by a fairly sizable company. I could think of three scenarios for processing (mining) any placer deposit we found: 1) haul water into the area from the Colorado River or from Lake Havasu to wet-separate the heavy gold from the lighter quartz and feldspar sand and gravel, 2) haul the gold-bearing sand and gravel to the water, presumably the Colorado River, for wet-separation offsite (no doubt requiring further land acquisition), or 3) dry wash the sand and gravels without water. Dry washing using the oldtimers' dry winnowing method is notoriously inefficient at gold recovery and can be totally worthless if not done with extreme care and diligence. How we get gold in California: winnowing gold, near Chinese camp. Original in Harper's Monthly, v. 20, 1860; source: Library of Congress (no known restrictions). Of course there are more current methods of dry washing available than winnowing, if you happen to have some gold-bearing sands and gravels on your Mojave placer claims. I'd look into the Bedrock Dreams website, which shows many possibilities and has a lot of info for the up-and-coming small-time gold miner (hard rock and placer). Dry panning and air winnowing hadn't done much besides create a lot of dust and two ravenous geologists. So we put the gold pans away and turned our thoughts toward dinner. The sun was fairly low over the Turtle Mountains to the northwest, and my time estimation method indicated we had about 1.5 hours to sunset. What should we eat? We went ahead and established our Mojave Desert, south-of-the-border-style cuisine of tacos or burritos, with avocado and as much hot salsa and jalapeño as we could stand. This type of food is not too heavy for the heat, and (I’ll swear to this—or ask any desert rat) the spicy burning of the peppers created a cooling effect, something we would really need as our time in the desert progressed. Besides, there’s enough vitamin C in the peppers to fight scurvy, a credible desert plague: Rapid melting of the ice will spoil many vegetables and a few fruits over the course of our stay. Yeah, we had just arrived in the desert and were still greenhorns, not quite able to call ourselves Mojave Desert rats. Not yet. A little fooling around with SunCalc produced this reproduction of sunrise and sunset at our campsite (approximate location and date). As the sun sank behind the Mopah Peaks, I thought about the next day. We'd be moving upslope into the Whipple Mountains proper. We were done with the placer submittal and, back in Reno, would recommend “No Further Work.” Although we didn't really know how large the weakly gold-bearing sands are, we suspected that their likely flash-flood origin from upstream copper-gold diggings in the Whipples would make mapping out the gold bars and channels difficult at best. After seeing Ron Schott's awesome and enlightening GigaPan of the Roan Cliffs, I decided I had to mark some contacts on the photos from my last post (and partly because what I said or implied about the formations were a little off). To deduce the location of these contacts, I extrapolated from this USGS preliminary geologic map, using the USGS TNM 2.0 Viewer and Google Earth. 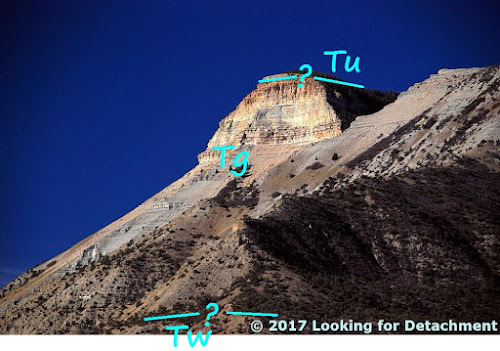 In the first photo, it's still a toss-up, imo, as to whether the Tertiary Uinta Formation (Tu) can be seen—but if so, it's way up at the top of the cliff. Most or all of the cliff and most of the slope is underlain by the Tertiary Green River Formation (Tg). Aaaaand maybe there's a bit of the Tertiary Wasatch Formation (Tw) at the bottom of the photo. In the second photo, there is (probably) just a tiny bit of the lower part of the Uinta Formation (Tu) above the cliffy area, and the reddish-brown foreground slopes are underlain by the Wasatch Formation (Tw). 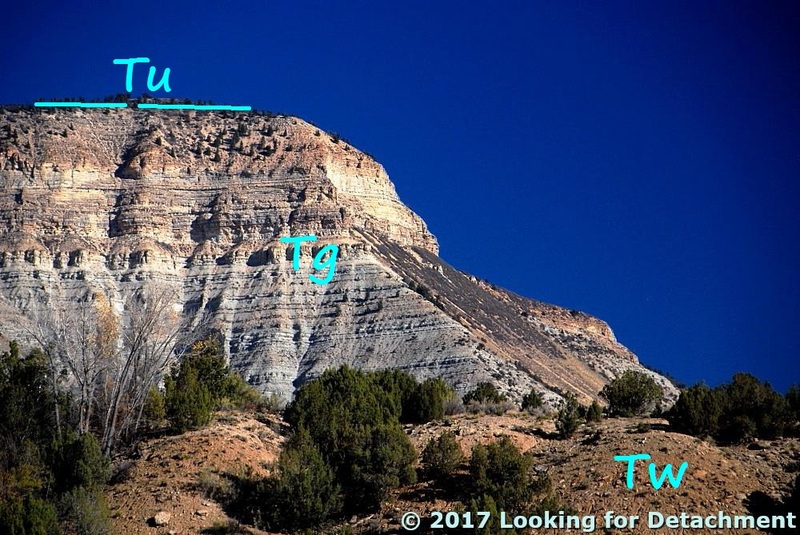 The rest, cliff and slope, consists of Green River Formation (Tg). Getting back to my October-November road trip (last seen here), I stopped to get some fuel in Parachute, CO, on what was Day 7 of the trip, and I ended up taking a few photos (surprise! ), partly thinking that the cliffs show good examples of bedding, and also because I was becoming fascinated by the exceptional talus slopes coming off the cliffs. The first photo is a cliff at a round nose sticking out from Mt. Callahan. The second photo is of a cliff at the southern end of a nose known as Allen Point, a long skinny ridge running about 1.5 miles south of a broader, arcuate area also called Allen Point. When I investigated this area after my trip was over, I was surprised to find that these cliffs are part of the Roan Cliffs: while still enroute, I thought I was driving along the Book Cliffs. 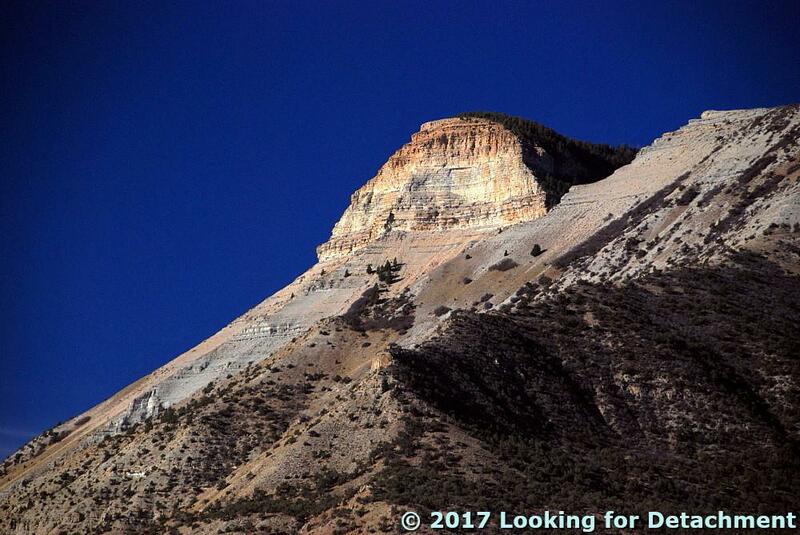 The Roan Cliffs are the cliffs that break south off of the broad Roan Plateau, a large plateau area that extends from Rifle, CO, to at least somewhere north of Grand Junction, possibly bounded on the west by Roan Creek. 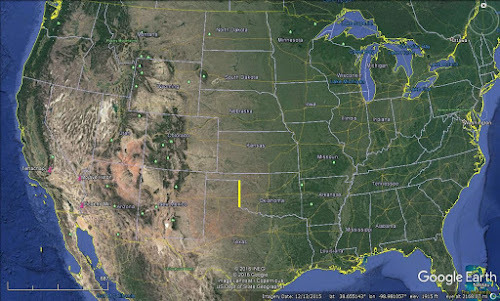 The Roan Cliffs, however, at least as shown here, encircle a broader area extending westward from Rifle, CO, to the mountains just east of the Wasatch in Utah. The Roan Cliffs are capped by the Eocene Uintah Formation (which we may or may not see in these photos), and slopes below the uppermost cap are composed of the Eocene Green River Formation. Some of the lower, reddish slopes in the area are underlain by the Paleocene to Eocene Wasatch Formation. You can read a little more about the geology of the area in this USGS Bulletin. The Roan Cliffs stratigraphically overlie the Book Cliffs, which we'll see later. I'm not sure how I mistook the cliffs of the Uintah Formation and upper Green River Formation for cliffs of the Cretaceous Mesaverde Group, or slopes of the Green River Formation for the usually easy-to-spot Cretaceous Mancos Shale. I can only plead that geology at 70+ mph isn't always spot-on. I planned to have this descriptive section as part of the last post—the one about being packed and ready to leave town—but this "little bit" grew and grew, and eventually it had to find its own home. I've written lots of little pieces like this; many of these could be hyperlinked from several main posts. This one might most properly go near the beginning of a Tales of the Mojave book. Northern Exploration Company (NEC), a famous former international mining and minerals exploration company, had seven exploration offices when I began working there as part of a small horde of young or “junior” geologists in NEC’s Western District. Some of us were temporary summer hands (and many of us, like me started that way); many of us were on year-to-year contracts (me! ); and a very few of us ended up with permanent positions in the company. There were three or four permanent geos leading the horde when I began working there; that permanent cadre had expanded to maybe six by the time I left. When not out in the field, we worked out of one of several office-warehouse complexes scattered here and there in Reno and Sparks. The complexes seemed to have been slapdashed together and often had a few problems; for example, the typical southwest-desert–inspired flat roofs were prone to leak during storms or snow-melt. Our complex—and a nearby complex leased by another, also famous former mining company—was near the Truckee River and so occasionally flooded. The large windows of the office half of our complex faced south across a largely undeveloped area of the Truckee Meadows; these windows caused overheating, especially in winter when the low sun provided unplanned for solar energy. Nonetheless, we had a good setup that included a smallish warehouse in the back with shelves for field supplies, tables for core logging, and rock saws and grinding wheels for cutting and polishing hand samples. The Western District of NEC was a decidedly renegade district, though at the time renegade attitudes were fairly common within exploration groups based out of Reno. Geologists aren’t ordinarily known for their adherence to rules, and they are especially not known for following pointless and questionable rules sent down from above—an above that was usually either outside the country or east of the Mississippi, the latter being nearly the same thing as a foreign country to those born and bred in The West. We can argue nearly forever about where The West begins or ends. The Mississippi River clearly constitutes one viable boundary for defining what is east and what is west. The hundredth meridian has also been used as the boundary between east and west; for example, in 1843, Thomas Farnham said lands between the 100th meridian and the Rockies were “usually called the Great American Desert” (Stegner, 1954). Later, Thomas Durant held a “100th Meridian Excursion” when Union Pacific crews passed the 100th meridian in 1866, a goal set by Congress. A little later, John Wesley Powell, writing for the USGS in 1879, recognized the 100th meridian as a line roughly defining the eastern boundary of his “Arid Region,” an area that generally receives less than 20 inches of rainfall per year and encompasses most of the west (by any definition). I think one could also use the Great Continental Divide as the boundary between east and west: All drainages east of the divide would drain to the Gulf of Mexico or the Atlantic. All drainages west of the divide would drain to the Pacific. 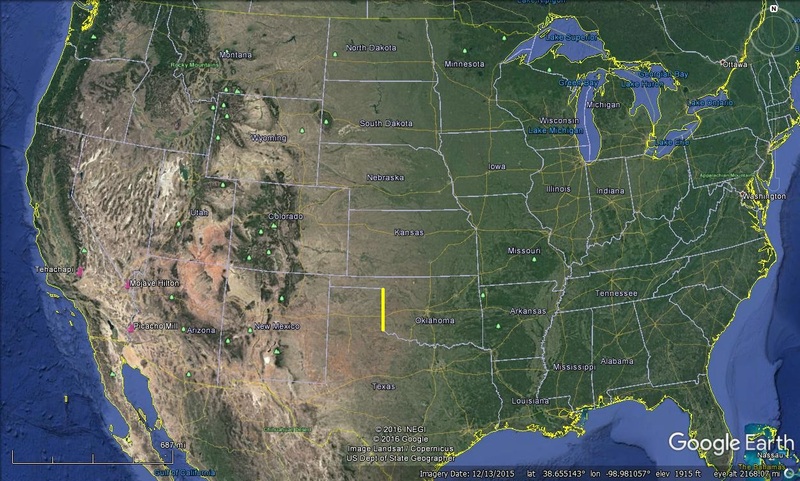 Google Earth image with yellow line marking part of the 100th meridian. The meridian cuts several states in two and roughly separates a greener area in the east from a notably browner area in the west. Our Hughes 500-D in 1978. The Western District of NEC came to be known, at least to a select few, as “The Kmart of Exploration.” This appellation had been assigned to NEC by a summer hire —Dan, the guy with the Frisbee dog, a black and white Aussie of one variety or another—during the uranium summer of 1979. He said he came up with the epithet after being involved in procuring supplies and provisions for the field largely at Kmart. I thought the nickname—seemingly indicating that the company was cheap—was overstated; after all, each uranium camp had a trailer with space for a full kitchen; an office with drafting area, map storage cabinet, and beaucoup supplies; a camp cook; canvas tents with room for two field hands in each tent; a couple of 1978 4WD pickup trucks, brand new during the uranium summer of 1978; and a Hughes 500-D helicopter equipped with radiometric instruments capable of detecting radiation and breaking it down into the three major source elements, potassium (K), thorium (Th), and uranium (U). I thought our camps and equipment were pretty plush, especially when compared to the archaeological camps my husband frequented. Much to the head honcho's dismay, "Kmart of Exploration" stuck. Perhaps it was partly our field schedule that made the name stick. We worked eleven and three, drive-on-your-own-time. That schedule meant eleven days in the field, three days off, with the driving time between home and field (and vice versa) being on our own time, not on paid-for company time. Perhaps the name stuck because we were encouraged, if not required, to camp out rather than stay in motels. Camping supposedly saved gas, time, and money because we didn’t have to drive in to town every morning and evening and didn’t have to spend money on motel rooms. We also bought groceries instead of eating in restaurants, resulting in a lowered food expense. So we typically lived outdoors—in the dirt and weather of whatever area we were working in—for two to four nights; then we were into town for one night to get a shower, to sleep in a cool, air-conditioned motel room, to gas up, to stock up on fresh food, and—most importantly in the Mojave—to stock up on water and ice. Then, back into camp mode we went. I thought there were some flaws to the party line about camping, although I never did an actual cost-benefit analysis. For one thing, those of us who didn't have a permanent camp located somewhere near running water in the higher and cooler reaches of eastern Nevada (a certain lucky few that I was rarely part of) spent a certain amount of time setting up camp every evening. After getting our new camp in order, we made dinner and cleaned up. Then, nighty-night. After waking up in the morning, we tore everything down and repacked the back of the truck. With all the unpacking at night and repacking in the morning, we often ended up rearranging boxes of sample bags twice a day. Because we prepped our own camp and food daily, we were essentially working twelve to fourteen-hour days, rather than ten, with little time to rest or recoup in the evening before falling asleep (on cots or on the ground). Ten-hour field days were de rigueur at NEC. That meant we'd quit camp at 7:00 am, say, with breakfast and camp tear-down already complete, then work in the field until 5:00 pm. Then we'd finally get on to camp setup and dinner making after that. When someone else was cooking your meals and when there was running water available for cooling off and even showers, as in the uranium and moly camps, the hours were okay—long, but feasible. In the Mojave, they were hell. Stegner, W.E., 1954, Beyond the hundredth meridian: John Wesley Powell and the second opening of the west: Penquin Books, 496 p., 1992 reprint. Quote from p. 215-216 of 1992 reprint.